Contact Boat Owner Chuck 231-487-0692. 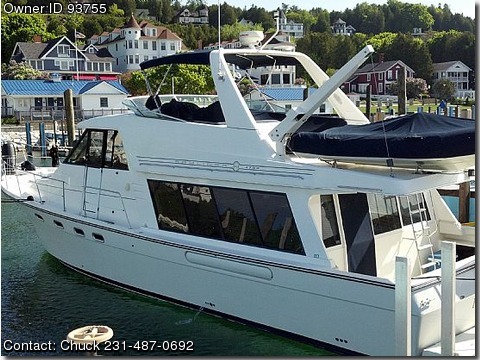 Pilothouse Motoryacht - Pilothouse, salon/galley, 3 staterooms 2 full baths (one w/shower, one w/shower & tub), Upper station. Misc: Full navigation electronics both lower and upper, 2 TVs, full galley, VacuFlush heads, entertainment electronics, and much more... (jet powered dingy not included, but might be available) Price: REDUCED! - $230K (please call my office - 231-487-0692).